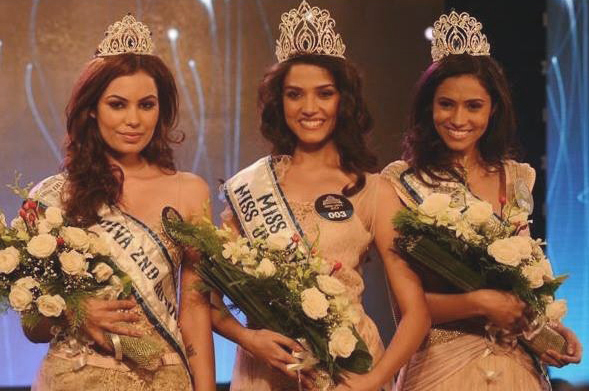 Manasi Moghe (center) was crowned Miss Diva 2013 (Miss Universe India 2013) during a star-studded event at Westin Mumbai Garden City, Mumbai on Thursday evening. The 1st runner-up is Gurleen Grewal (right) and the 2nd runner-up is Srishti Rana (left). Moghe was crowned by former Miss Asia Pacific 1970 winner, Zeenat Aman. Moghe will compete in 2013 Miss Universe pageant to be held in Moscow on November 9th. Former Miss Universe 1994 Sushmita Sen held the Indian franchise for Miss Universe for three years, but decided not to renew it. Femina Miss India reacquired the franchise (they had held it for over three decades) and created a separate pageant, Miss Diva, strictly to select the representative for Miss Universe.